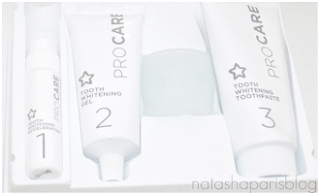 I recently purchased the 'Superdrug Tooth Whitening System 14 day treatment kit' £8.99.I know that this post won't be for everybody but it was requested by a lovely reader that I do a review on this whitening kit so here I am writing one. 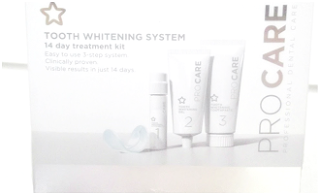 The whitening system operates a 3 step system - whitening accelerator (step 1), whitening gel (step 2) and whitening toothpaste (step 3) which makes it very easy to use. Firstly you brush your teeth as normal and prepare the mouth tray by squeezing the whitening gel into it (be careful not to overfill!). Then apply the whitening accelerator to the teeth by rubbing the accelerator pad against the surface of the teeth (at this point you have to keep your mouth open to avoid the accelerator from being removed). To finish rinse your mouth thoroughly to remove any residue and brush teeth as normal using the whitening toothpaste. My teeth definitely do look a little whiter after using this kit, but I definitely don't think they are 'up to 6 shades whiter' as it says on the box. However if I had used the kit twice daily as recommended rather than once daily (I only have time to brush and go on a morning) I'm sure I would have achieved even better results. I was going to do a before and after picture so I could show you the results but I forgot to do the before picture and pictures of teeth just don't look flattering do they? so you'll just have to take my word I'm afraid. I am still not giving up on the mission to get a whiter, brighter smile so if you have any teeth whitening product recommendations please let me know in the comments below. This kit is available to purchase for £8.99 from Superdrug in store or online (link). I've been neglecting my teeth whitening recently, If I decide to start again I'll give this a try.